Alex Polvi and Brandon Philips, the co-founders of CoreOS, saw firsthand the efforts taken to secure the front-end of the internet at Mozilla. What was missing though, and where security is lacking, is on the back-end with servers. Their mission is to "secure the internet" from the back-end and create what is the equivalent of an “Android operating system for the datacenter.” Together, they built a team of world-class systems engineers to actively create new open source solutions to make GIFEE available to all companies. We first met the team through Joey Schorr and Jake Moshenko, who developed Quay.io, the first private container registry. 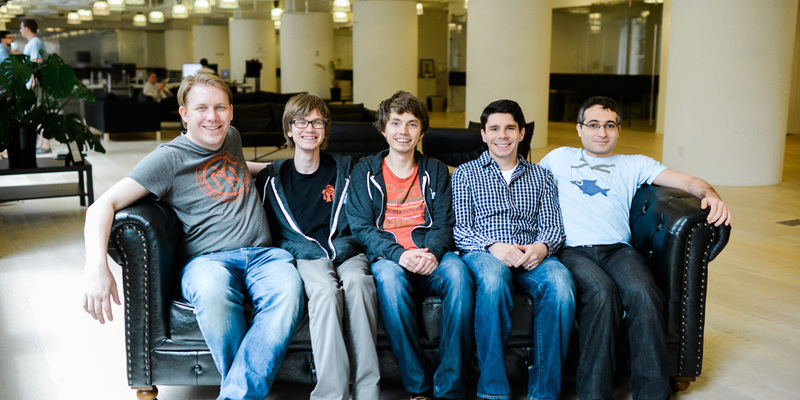 They were acquired by CoreOS and moved into Work-Bench in October 2014 to build out an NYC presence for CoreOS. As Alex explains, “developing truly impactful technologies in the long term means understanding the real problems that businesses face in areas like security and infrastructure.” And with nowhere else better positioned to do just that than in NYC, CoreOS has been fortunate to have a talented engineering team at Work-Bench that is closely connected with the tech and business communities. Working side by side with their New York office (see below), we got to further know CoreOS and the team in San Francisco and Berlin through various community events, culminating with a panel we moderated at Tectonic - their two day customer Summit in New York City. At the panel - on whether containers would power financial services applications - Goldman Sachs announced that they were putting their first containerized workloads into production the same week as the conference - a first step to where they are today, using Kubernetes to manage large infrastructure deployments. Seeing firsthand the tangible excitement and progress that this new infrastructure paradigm was generating was the icing on the cake, and we’re excited to continue on the path and work together to create a more secure internet. IT Operations employees spend much of their time fighting fires - managing system outages, rolling out updates, and dealing with machine failures - instead of shipping secure and scalable solutions for their customers and employees. On the flip side, as our lives become more and more connected, we continue to be exploited through the digital products and services we use. With more than 300 reported data breaches to date in 2016, the lack of security on the internet is not only an issue for us as consumers, but increasingly to enterprises that manage the infrastructure that powers these services. CoreOS believes that the key to solving both of these problems is through automatic updates for machines and applications in the datacenter - similar to the way it is done on smartphones and the browser. The team’s flagship product, Tectonic, combines everything required for an enterprise to run containerized, secure, and scalable production workloads, i.e. the same infrastructure practices Google uses, but for the broader Fortune 1000. This enables developers to create innovative new web applications and software solutions that can scale and address the needs of today's always-on, always connected global marketplace without increasing operations headcount. With the company’s latest announcements on scanning for vulnerabilities with Clair, integrating Soundcloud's Prometheus for monitoring and running Openstack better with Kubernetes, we believe that CoreOS is uniquely positioned to own the cloud infrastructure market with its portfolio of products. They’ve been focused on enterprise since Day 1, directly addressing huge pain-points related to security, and having these conversations with corporate IT leaders early. With a lot of excitement in our own corporate network about Kubernetes and CoreOS, we are thrilled to partner with them on their quest to enable companies of all shapes and sizes to run like Google and secure the internet. CoreOS has a terrific NYC engineering team that is based at Work-Bench, so if you’d like to join the company, check out their open roles here. If you’re interested in IT Staff training for Kubernetes & Tectonic, check out the various training modules offered by CoreOS here. CoreOSFest is underway! Stay tuned for latest announcements. And lastly, see more coverage in TechCrunch, InformationWeek, and SiliconANGLE!